Valentine’s Day is coming up and Picture's On Walls continue their commitment to commemorate it by releasing a timely yet vaguely inappropriate print. 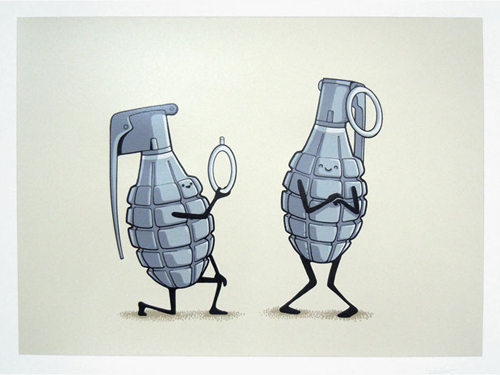 This is ‘Dangerous Proposal’ by Nacho Diaz. What more could you want? It‘s cute, it’s true, it says ‘my love for you will destroy us both in a hideous and violent way’. This new edition is a 6 Colour hand pulled silkscreen, 300 gsm Somerset velvet white, Edition 80. Size 59.6 X 46 cm. £95 It is available now via the Pictures On Walls website.